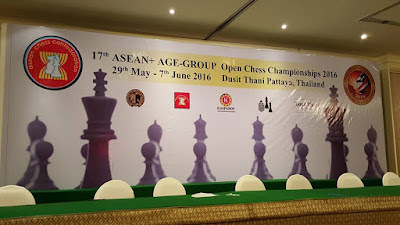 The 17th edition of ASEAN+ Age Group Open Chess Championship or popularly known as AAG had just ended yesterday. For this year edition seven ASEAN countries have participated as well as other seven non ASEAN countries. According to ASEAN Chess facebook, a total of 340 chess players from 14 countries take part in the championship which is held in Pattaya, Thailand. There are three formats of play in the championship namely Standard, Rapid and Blitz. For Standard Chess, each player is accorded with 90 minutes + 30 seconds increment (starting from move 1). Meanwhile for Rapid Chess and Blitz, each player is accorded with 25 minutes and 5 minutes respectively to complete the game. 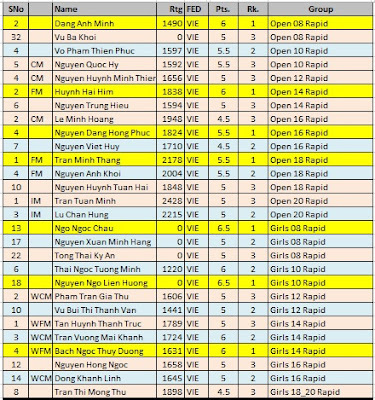 There are 133 players representing Vietnam in 13 different Age Group categories. 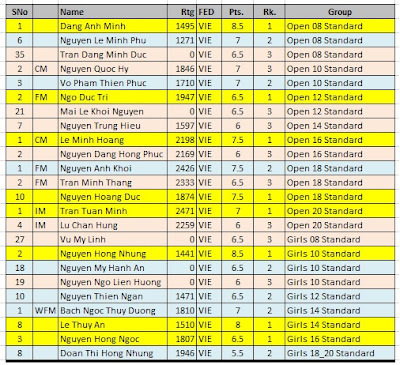 In Standard Chess, eight (8) Vietnamese players have emerged on the Top spot, other seven (7) achieved Second place while the other nine (9) got Third place. In total, twenty four (24) Vietnam players are among the Top 3 in the Final Ranking. 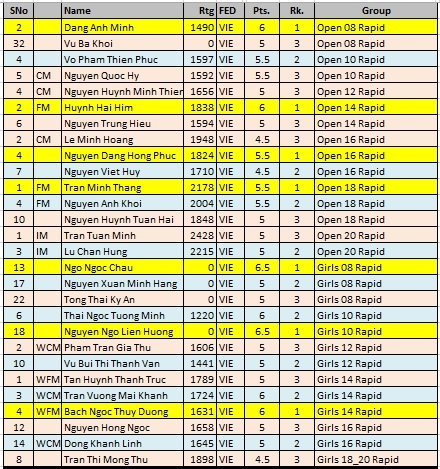 In Rapid Chess, in total of twenty eight (28) players from Vietnam are among the Top 3 Final Ranking. Seven (7) of them won the First place, another nine (9) got the Second place and other twelve (12) are in the Third place. 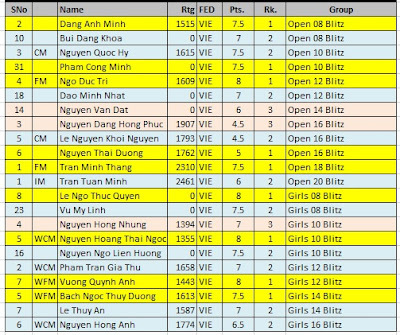 In Blitz Chess, Vietnam has the least number in the Top 3 Final Ranking which is twenty two (22), less two in Standard Chess and less six in Rapid Chess. Nine (9) players are First place, Ten (10) are Second place and three (3) are Third place. Among the Vietnamese players to watch is Dang Anh Minh. He has emerged on the Top for all the three formats of play in Open U8 age group category. There are 51 participants playing for Philippines in 13 different Age Group categories. 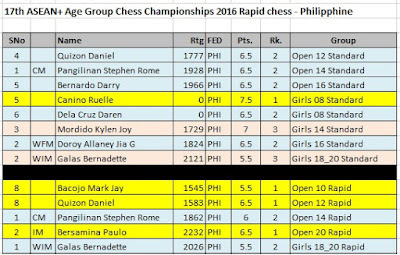 In Standard Chess, Philippines has eight (8) players winning the Top 3 in the Final Ranking. One of them got First place, while five (5) others got Second place whereas the other two (2) earned the Third spot. In Rapid Chess, Philippines has the lowest number of players in the Top 3 Final Ranking among the three formats of play. Only five (5) Filipino players are among the Top 3 Final Ranking with three (3) of them win the First place and the other two win the Second place. None wins the Third place. 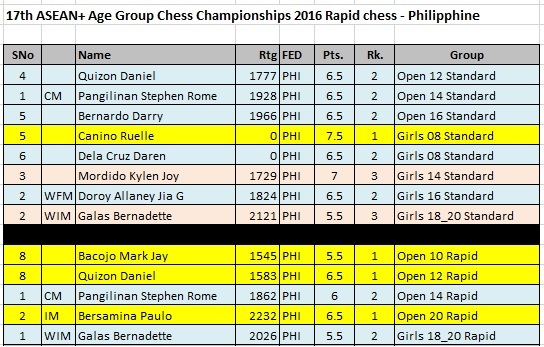 In Blitz Chess, twelve (12) of the total 51 young Filipino chess players are among the Top 3 Final Ranking. Three (3) won the First place, Two (2) got the Second place and the other seven (7) earn the Third spot. Among the young players from Philippines to watch in the eyes of GiLoCatur are Quizon Daniel and Canino Ruelle. The former who plays in the Open 10 age group category wins Second place in Standard Chess, First place in Rapid Chess and Third place in Blitz Chess. Actually, Quizon has the same 6.5/9 points with the First place winner from Vietnam, FM Ngi Duc Tri, just losing due to tie break. Meanwhile the latter ie Canino Ruelle who plays in Girls U8 age group category wins both Standard Chess and Blitz Chess. CM Pangilinan Stephen Rome is a bit familiar to GiLoCatur. He also took part in the 15th AAG in Macau two years ago in Open 12 age group category. He was Fourth (in the chess-results Final Ranking) in Standard Chess which won by Malaysian Wong Yinn Loong, as well as in Rapid Chess. He was Second in Blitz Chess. 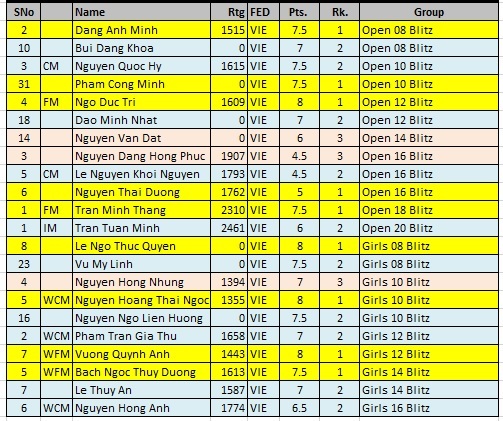 In fact, in 13th AAG in Hue, Vietnam, CM Pangilinan was the Silver medalist (Second in the Final Ranking) in the Standard Chess for Open U10 age group category. IM Paulo Bersamina is another Filipino player that is very familiar to GiLoCatur. He won all the three formats of play - Standard, Rapid and Blitz, in the 15th AAG Macau two years ago in the Open U20 age group category. For info, GiLoCatur was at the 15th AAG 2014 held in Macau accompanying Fahim, GiLoCatur's youngest child. 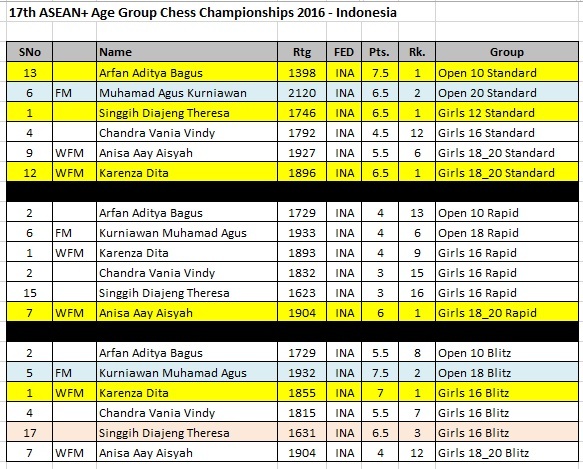 Indonesia has a small number of players in the 17th AAG with two males and four females. In Standard Chess, three (3) of the Indonesian chess contingent win the First place in the Top 3 Final Ranking and another player earns the Second place. In Rapid Chess, only one player is among the Top 3 Final Ranking. WFM Anisa Aay Aisyah emerges on the Top in Girls U18_20 age group category. In Blitz Chess, half of the Indonesian chess team are among the Top 3 Final Ranking. Can Indonesia have another Woman Grandmaster in WFM Karenza Dita and Singgih Diajeng Theresa? 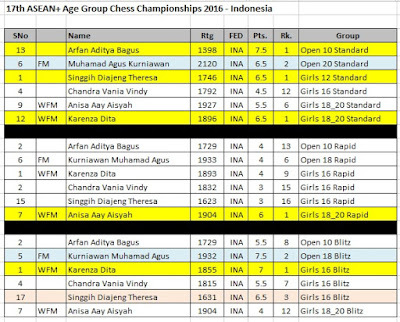 And can Indonesia have another Grandmaster in Arfan Aditya Bagus? Let's see in few years to come. GiLoCatur notices that WFM Anisa Aay Aisyah (actually, Aay Aisyah Anisa) is not among the Top 3 in this year AAG edition in the Standard Chess. 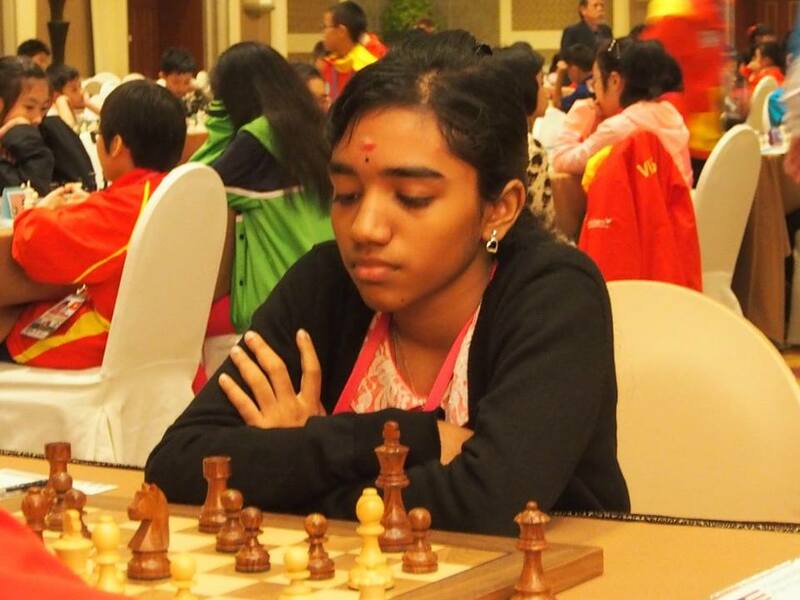 But she did well in Rapid Chess winning the Girls 18_20 age group category with 6/7 points, half-point ahead of the 1st Runner Up. As GiLoCatur recalls, she was the champion in 13th edition. During then, she was playing in the Girls U14 age group category. She got her WFM title then. How about the other ASEAN countries? The host country, Thailand has 59 players in the championship. Myanmar is represented by two players, while Singapore is represented by eight (8) players. How about Malaysia? Malaysia sends forty five (45) participants in the championship having one player in the Top 3 Final Ranking in Standard Chess and Rapid Chess. The Malaysian player who wins the Third place in Standard Chess and the First place in Rapid Chess is Nithyalakshmi Sivanesan (photo above). (note: The number of players exclude Seniors age group categories and ASEAN chess). 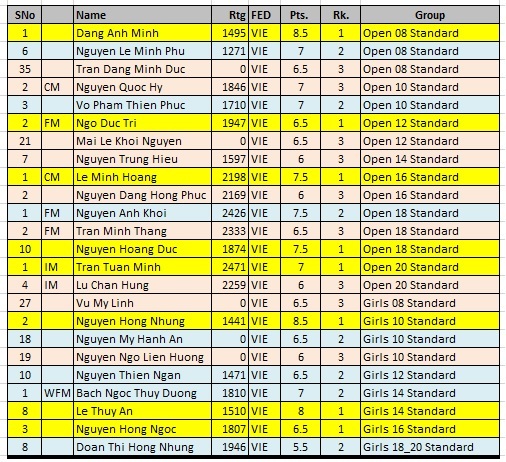 The full results of the 17th AAG Open Chess Championship can be viewed here.